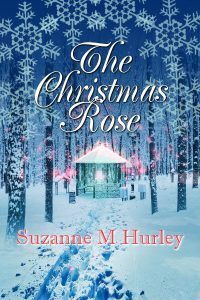 The Christmas Rose by Susanne M Hurley – Who stole the the Christmas rose ornament worth a million-dollars from philanthropist Eugene Turner’s mansion? High school principal Olivia Lyons is appalled to discover that one of her students is suspected of stealing an expensive tiny golden angel holding a red rose. As if that isn’t enough, she is shocked when the new guidance head, Steve Lesnick, thinks she stole it. Sparks fly as Olivia sets out to uncover the thief, all along dealing with her growing attraction to Lesnick. Will she end up in jail, in love, or both? 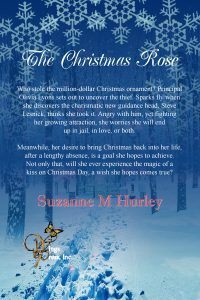 The Christmas Rose is written in the first person and the reader is very swiftly drawn into Olivia Lyon’s life. In fact, the novel is so well written that you could almost believe that Olivia was a real person. At thirty-two, Olivia is the principal of a school, Centennial High in Belltown. Her mantra is, “she never wants or needs a man” but then she falls for Dave, a married con man who plays upon her good nature and takes her money. Worse, Dave also has a vengeful wife. The story line is made all the more realistic by sub-plots concerning the theft of a valuable ornament and dealing with a disrespectful member of staff. has a plot that twists and turns like a snake. But I’m not revealing any more.